One of the Metal Shark Defiant patrol boats bound for Vietnam. 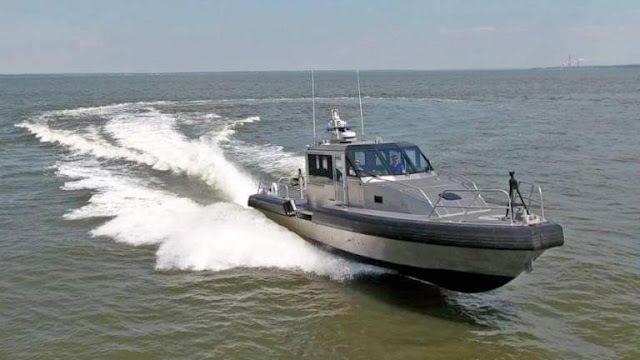 The Vietnam Coast Guard (VCG) received 6 new 45-foot Metal Shark Defiant patrol boats on 29 March 2019, as part of a security cooperation agreement signed in 2011 between Vietnamese and US governments. The value of the patrol boats is estimated to be US$12 million. The boats will be station with the VCG’s Region III Station at Van Phong Bay, and includes trailers and spare parts. These patrol boats are expected to be used to improve the VCG’s ability on maritime law enforcement, maritime search and rescue, and maritime humanitarian assistance operations within its territorial waters and exclusive economic zone (EEZ). Vietnam previously received a batch of six similar boats in 2017, and another six in 2018. Another six units is expected for delivery probably by 2020. The Metal Shark Defiant boats were manufactured in the US by Gravois Aluminium Boats LLC, and are capable of speeds exceeding 35 knots, with the manufacturer claiming of speeds of up to 50 knots.